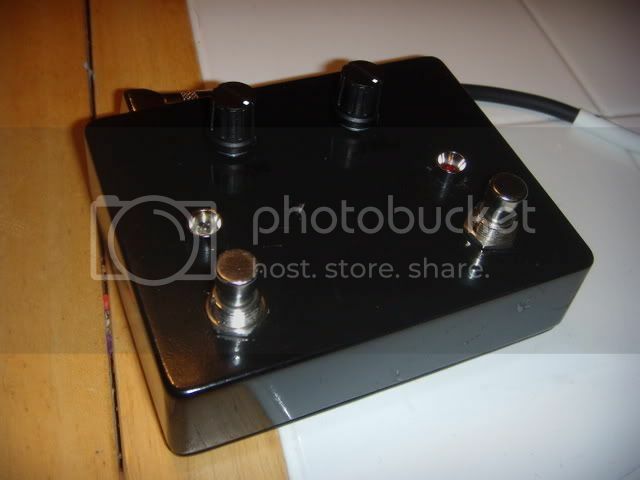 Here's the prototype for the DOD 250-based OD pedal I'm working on. My plan was to keep the stock 250 specs but have a footswitchable "hot" mode that swaps out a resistor for higher gain and turn on a LED indicator. Here's what it looks like so far. I used a 1590 enclosure so I could fit the extra stomp switch. The knobs are gain and level, the left switch turns the pedal on, athe right swiutch activates the higher-gain mode. If you;re in the "hot" mode The red LED stays on even if the pedal is bypassed, so you know what to expect when you turn the pedal on again. The guts are messy, but the next build should be much cleaner. Still trying to decide where I want to go with this. I have one more component I can switch out with the second footswitch, so maybe mess with a cap value to add bass, or see if I can swap a clipping diode. More experimentation and more beer is in order.